Have you ever picked up a new metal album, played it and went: “yeah, good one, but metal was better before. Like in the 70’s”? I have. That said, I have also picked albums up and pointed out that everything wasn’t better before. However, if hard rock and metal of the late 70’s / very early 80’s is your thing, then The Dagger just might be the band for you. Formed by three members of Swedish death metal outfit Dismember – drummer Fred Estby, guitarist David Blomqvist and bassist Tobias Cristianson – who hired former Sideburn vocalist Jani Kataja to form the kind of heavy metal band they just couldn’t seem to find anywhere. In later years there has been a somewhat renaissance of young guys playing what is knows as NWOBHM (New Wave Of British Heavy Metal) and bands like Enforcer, Portrait and In Solitude goes all in to get the sound of early Iron Maiden, early Saxon and more obscure NWOBHM-bands like Angel Witch and Mercyful Fate. That scene has dried out a bit so therefore it feel refreshing to make acquaintance with The Dagger. 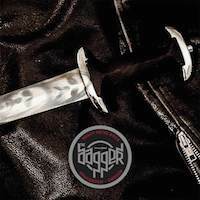 Also, The Dagger aren’t as much NWOBHM like other bands, they are more seventies hard rock and even though there are clear elements of Iron Maiden, Saxon and Judas Priest, there are also clear audible references to bands like Deep Purple, Rainbow, Black Sabbath and Thin Lizzy. Traces of the death metal of the Dismember guys is nowhere to be found. But to let you know exactly where this lot comes from musically, they state that the most important – and best – year when it comes to hard rock and metal is 1978. So much that they actually wrote a tune called just that. So check the year of your old metal records and you might have a guess how The Dagger sounds. Opener “Ahead Of You All” is a real killer and if you dig this, then it’s pretty safe to go out and buy this album without listening to the rest of the songs beforehand. The song comes across as an early Iron Maiden song complete with Ritchie Blackmore guesting, playing a solo for the song. “Ballad Of An Old Man” is a resplendent ballad that sounds like the love child of Iron Maiden’s “Remember Tomorrow” and Rainbow’s “Temple Of The King” and in “Skygazer” we have a palpable Deep Purple influence with some Saxon thrown in as well and a Ken Hensley (Uriah Heep) sounding Hammond. Saxon comes back in a seventies suit in the brilliant “Electric Dawn” and in said “1978” the guys goes real retro 1978 musically and also name dropping Taken By Force (Scorpions), both Stained Class and Killing Machine (Judas Priest), Live And Dangerous (Thin Lizzy), If You Want Blood – You Got It (AC/DC) and Never Say Die (Black Sabbath) and more a as part of the lyrics – and it is a brilliant tune. Things get a bit too familiar with “Inside The Monolithic Dome” where Deep Purple’s “Pictures Of Home” seems to be what the song is based on. Still, it’s a great song. “Dark Cloud” finishes the album like it started – this is heavily influenced by Iron Maiden’s debut album. With all the name dropping of bands and songs that I made here, it might seem like this band has no identity at all, but nothing can be more wrong. Yes, they wear their influences on their sleeves, but The Dagger really sounds like The Dagger. All the members has personality in their playing, but a lot of their identity has to do with the brilliant Kataja’s voice. The guy is the epitome of a 70’s hard rock lead singer, but at the same time he has his own style and edge and he master his job with effusive panache. I recommend everybody to check out his former band Sideburn as well. This is an album that has been in my headphones frequently recently and no one can say that metal was better before after blasting this record. 1978 it is!